The artichoke is said to be one of the oldest cultivated plants in the world. I am not too sure how long the artichoke has being grown here at Great Dixter but if it keeps raining it is going to be a vegetable of the past. The plants that I put in last year have started to rot off, I was sorry to see this today. We are on a very heavy clay soil, it has had a lot of organic matter added over the years but with this much rain things do rot. There is very little I can do at this point but in the spring I may add grit to the area they are growing in. 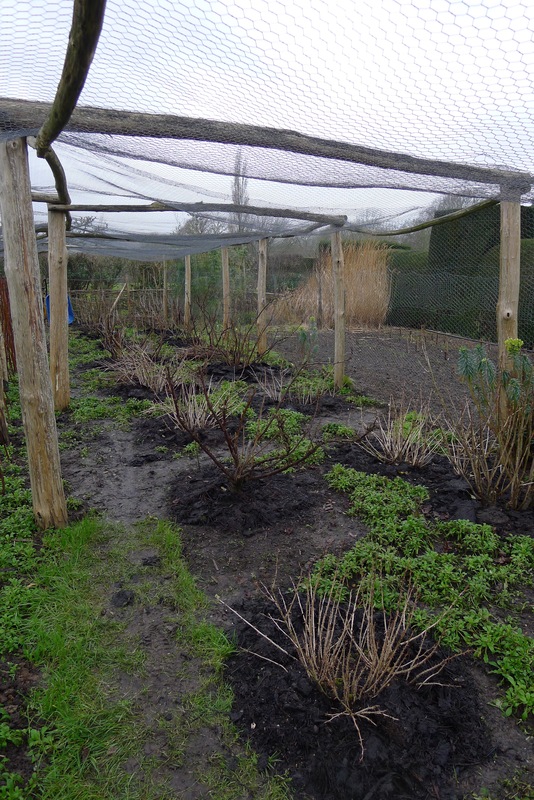 The autumn raspberries are now ready for the spring, it is great to have another area sorted. I am a little worried about going away for so long but I feel the garden will be fine. I will just have to work hard when I get back. With autumn raspberries you need to cut them to the ground in the winter, they will fruit on the new wood from the next spring. They are plants that need to be kept in order or will really take over. We have put a mulch of comport on the top and less broken down compost in the middle of the row. It is an area that still has a little bind weed in, I will keep on top of this in the spring. I have now pruned and put a thick mulch around the blackcurrant, redcurrants and gooseberries. I hope this mulch is going to help hold in some moisture in the hight of summer, I know that I do not give these plants enough water when it is dry but it is something I am going to do better this summer. I also hope that the mulch is going to help to keep the weeds down, the more one can do to lessen the work load the better I think, there is never enough time in a day. It is important not to cover the stems as you can get rot in the plants but really the mulch is needed around the edge. We must be doing something right up in the vegetable garden if we can produce such a good vegetable soup today from the garden. It was for the first of our study days of the year. It does make me think about how the food has changed since we took the cooking on. We are a fun team in the kitchen, we have a laugh but we all work hard. I am very happy if we can use as much from the garden as we can and our guests do seem to enjoy it. The dogs came out into the kitchen yard today and thought there had been a delivery for them, carrots that they did not have to lift on their own. The ‘Danvers’ carrot is still doing great for us. I love it when you choose a carrot for the name and it turns out to be a real doer. I was worried that after so long in the ground it would have started to grow white hair all over it as they do but maybe all this cold has stopped that. The only real problem seems to be a little damage from slugs and dogs. The seed comes from dear Kyle in the U.S and she ordered it from The Natural Gardening Company. The summer raspberries are looking very good now. The other side is ready for next summer. I think the most important thing about this job is making sure you dig out any of the suckers and move them back into the row. You will be very pleased you have done this in summer when the plants are covered in leaves. You can also use the suckers in areas of weakness. I do not always plan thing as well as I could. Sometimes I decide what I want to do and just start doing it even if it is not the best job because of the weather. That happened today, the soil was hard because of the frost but I had decided to work on the raspberries but I was a little limited in getting the plants out of the soil. By the end of the afternoon I was able to lift all the plants that were too far out of the row. I am so pleased to have the extra time to really clean things up, I will tie them in tomorrow.